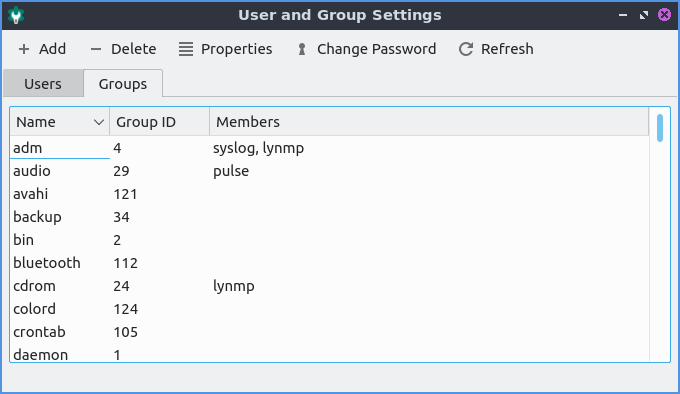 Users and groups lets you manage user and group settings on your system. 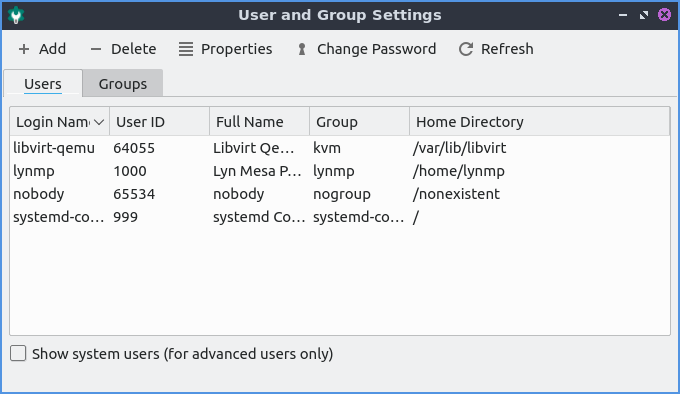 Lubuntu ships with version 0.14.1 of Users and Groups. The Users tab lets you manage Users. To create a new user account press the Add button. You will need to select the groups you want the user to be in under the Groups tab. Once the user information and groups are set press the OK button. Then you will be prompted to enter an administrative password. Next you will be prompted to enter the new password for the user. To change the users permission click account type and enter your password and select desktop user to not give permission to change the system or admin to change system settings. To view an info on a particular user press the Properties to bring up a dialog box or the accomplish the same thing by doubleclicking on the username. You can view the Login Name will show you the login name for the user and can be edited if you type in the box. The field User ID is the numerical internal id of your user. The field Main Group is the main group that is default group for files access to. The tab Groups under properties has checkboxes for each group you are in or which checkbox or each group you are not in. To change a user’s password select the user in the list then press the Change Password button you will be prompted to enter the new password. Then you will be prompted to enter an administrative password to authenticate that you have permission to do this. To reload the info on users and groups press the Refresh button. The Groups tabs lets you see info on groups and change properties. The Name field shows the name of the group. The Group ID shows the numeric group id of the group in the name field. The Members show the members of the current group. Changing user and group permissions without knowing what you are doing could break your system.